Will you be first to get a pie in the face? 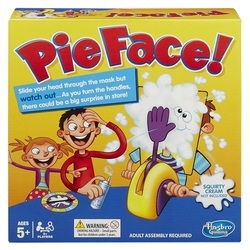 The Pie Face game is filled with fun and suspense, and somebody's bound to get splatted! ​It could go off at any time, so keep your fingers crossed and hope you're not the one who gets a splat in the face! You score a point for every time you turn the handle without getting pie-faced. The first player who scores 25 points wins - and stays clean (ish)!. Take some risks and hope for the best in this hilarious fun 'custard pie' game that's bound to prove a family favourite! Includes I pie thrower, 1 throwing arm, 2 handles, chin rest, splash guard mask, spinner and sponge.